The Center for Western Priorities released a new report, 290 Million Reasons to Invest in America’s Public Lands, estimating that U.S. public lands in Western states see more than 290 million visits each year. The report represents a first-of-its-kind analysis of total annual visitation to U.S. public lands in 11 Western states: Arizona, California, Colorado, Idaho, Montana, Nevada, New Mexico, Oregon, Utah, Washington, and Wyoming. Visitation to all types of public lands and waters administered by the four U.S. land management agencies — National Park Service, Bureau of Land Management, U.S. Fish and Wildlife Service, U.S. Forest Service — were considered in the report. According to the report, the popularity of public lands continues to grow. National park visits in the 11 Western states jumped from 81 million in 2006 to more than 108 million in 2017. National monument visits have nearly tripled since 2000. The popularity of national public lands is a significant factor in their local economic impact, according to the report. 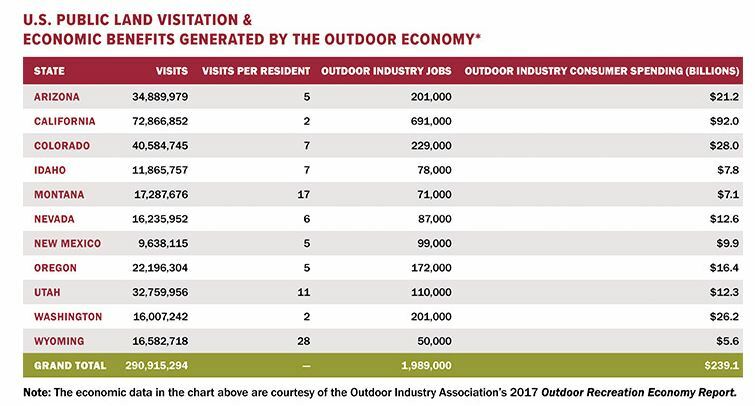 A recent study by the Outdoor Industry Association found the outdoor industry contributes $887 billion in consumer spending to the national economy and supports 7.6 million jobs across the country. The positive economic impact of public lands is especially outsized in Western states. Despite the enormous and growing popularity of U.S. public lands across the West, they are being funded and protected less by President Trump and his administration. According to the analysis, funding for all federal land management agencies as a percentage of the annual discretionary budget has declined since 2000. President Trump’s 2019 budget proposes a 16 percent cut to the U.S. Department of Interior. At the same time the Trump administration has undertaken an unprecedented attack on public lands by eliminating more than 2 million acres of national monuments in southern Utah, an action facing multiple legal challenges.